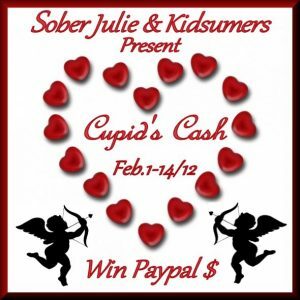 Kidsumers and Sober Julie Doing Life are hosting the Cupid’s Cash Giveaway. Why would you want to sign up? Fellow blogger friends…now is the time to sign up for this amazing event! Sign up’s are now available and will close on January 27th, 2012 at midnight EST. Fees to join in are:$7 USD for 1 network, $10 USD for 2 or a special deal of $15 USD for all 4. 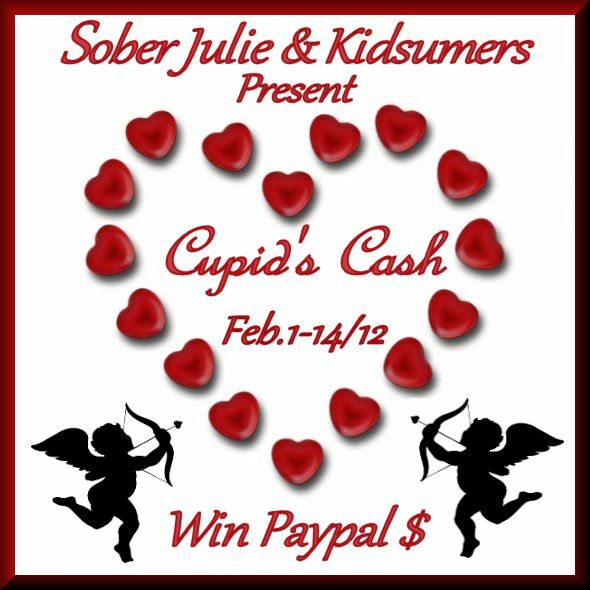 Prize will be dependant upon number of entries and will be in the form of Paypal funds. $7 USD per social media entry or $10 USD for two and $15 for all 4 (the made through paypal as gift) to include your blog in the giveaway event must be received no later than January 27th, 2012 at midnight EST. Entrants will be required to follow the two hosts, and all other participants will be listed as optional entries in the order that they join. When the winner is chosen, participants may be asked to confirm that the winning entry is valid by confirming that they arefollowing. Hosts are not eligible to win; participants are eligible to win. You will be required to use the provided verbage highlighting the Cupid’s Cash Giveaway in a post post on your site on the giveaway start date and up until the giveaway ends. We will be using Rafflecopter as our required means of collecting entries. Please do not start this giveaway event before start time or end before specified end time. Please make sure to check your spam folders over the next several weeks to make sure you receive required emails from Sheri and Julie. We do understand that emergencies arise, so in the event that you cannot participate, you MUST letone of us know (and get a response back) by email no later than January 27th,2012 at midnight EST to receive a refund. Otherwise, your payment is non-refundable. The giveaway code and rafflecopter widget will be sent to everyone via email on January 29th. Pleasemake sure you receive this email or contact us asap if you did not receive it. Let’s make this a fun and fabulous event!! Sent in my paypal! Can’t wait!! This is great!!! I’m in! Sounds like fun! I need to figure out google+, so this might help me get some followers.